Whalen & Company, CPAs recently promoted two key individuals within their firm. 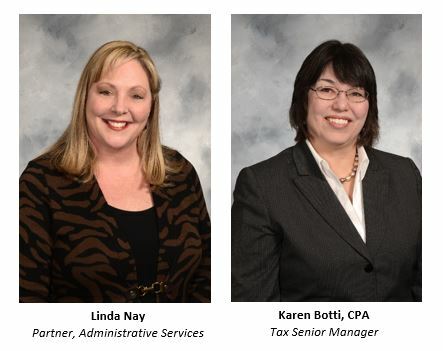 Linda Nay has been named as Partner, Administrative Services and Karen Botti, CPA has been named as Tax Senior Manager. As the firm’s newest Partner, Nay will work closely with the other firm Partners in the management of the firm, overseeing the administrative department and serving as the firm’s human resources director and IT coordinator. She has been with the firm for more than 30 years and has previously served as a receptionist, administrative support specialist, office manager, and director. Enterprise Worldwide, an international association of accountants and advisors, has previously recognized Nay as the Top Firm Administrator among their member accounting firms. As a newly appointed Tax Senior Manager, Botti brings more than 30 years of experience in the public accounting field. She has extensive experience in preparing and reviewing federal, state and local income tax returns for nonprofit entities, businesses and individuals. She serves as a resource to clients and staff in a multitude of areas.